That is not hyperbole. 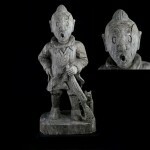 Seriously, this is the coolest thing I have ever seen – a sculpture of the classic children’s book character Tin Tin that was rescued from obscurity in Thailand. Dude, seriously, this is cool. I love Tin Tin and have all the books and any number of related collectibles. But this is unique and I am really tempted to purchase it. The price tag of $800 is a little steep – but it is a unique one of a kind piece right? I found this sculpture on the website for Paxton Gate, a San Francisco-based landscape design group. Please either talk me out of buying one of these or make me feel better about why I need to by one. When I was a kid my brother saved up enough money ($12) to buy a ukulele and I have been jealous ever since. I was never a good saver for one thing, and he never let me play the ukulele. 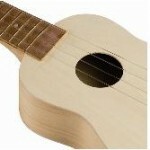 Well, I may have the last laugh, I found this “My Ukulele: four strings for Fun” kit at Brooklyn 5&10. It is slightly more than $12 and you do have to put it together, but that could be fun, right? We are already planning our 2011 August trip to Chicago where we love to soak up the Cubs, street festivals, and summer theater on the shores of Lake Michigan . We also like poking around the neighborhoods and interesting shops. Even though she is an ocean away, our mate Sophie is always spotting places for us to try on our next trip to Illinois . Such was the case recently when she turned us on to Urban Remains. You know how we love old things lost and found and rediscovered. It looks like Urban Remains is made for us! I can’t wait to check this place out. 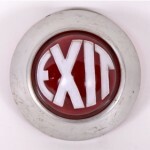 The website features many cool things, like this 1920’s “exit” sign fixture. Very cool! Seriously – the stuff here is great – check out the list of things Urban Remains has sold already. We are not taking a stand on gay marriage, in general, we support the idea, but don’t want to get all political up in here. 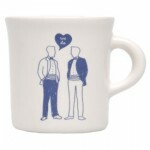 But what we can say definitively is that we love the “we do” mugs featuring a male couple. How can anyone object to this gem from Fish Eddy? Lost Cowboy is powered by	WordPress 5.0.4 and delivered to you in 1.079 seconds using 46 queries.